I think I’m setting a new record here for time in between blog posts. Fall is such a busy time anyway, but this year ours has been plagued by time-consuming work duties (Rob’s work, but I’m helping), home repairs, more home repairs, and car malfunction. Ouch. These things do seem to come (unpleasantly) in clusters. I’ll not drag you through the details, but do look for an upcoming post about camping with a Uhaul pickup–once I can laugh about it. But we’ve been crafty in between all these diversions. I made a sweet new dress but don’t have any pictures yet and we’ve gotten a little obsessed with freezer paper. I made these shirts for my kids and nieces for my sister-in-law’s 30th birthday. You can find good tutorials for making freezer paper stencils on other blogs–the basic idea is that you cut out our design for the shirt with a craft knife, then iron the shiny side of the freezer paper to your shirt and dab paint in the missing spaces. I was able to make all four of these shirts from one stencil; you can just peel it off and reuse it several times. 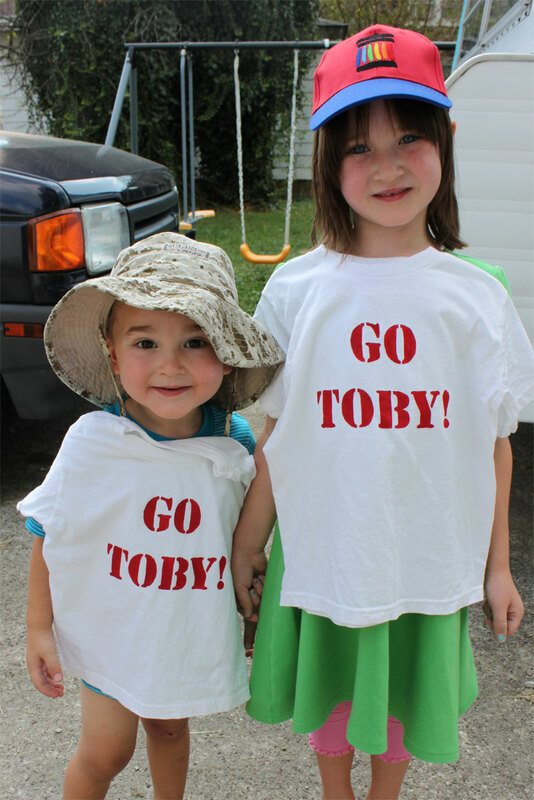 I had picked up packs of plain t-shirts at Target for us to be crafty with this year (they came out to $.80 per shirt, on sale) so I was well supplied when I got the idea to make more shirts to support my friend Toby who was participating in his third Ironman triathlon. The marathon portion goes right by our house, so the kids and I like to cheer him on and be inspired by all the men and women competing in that very impressive event. 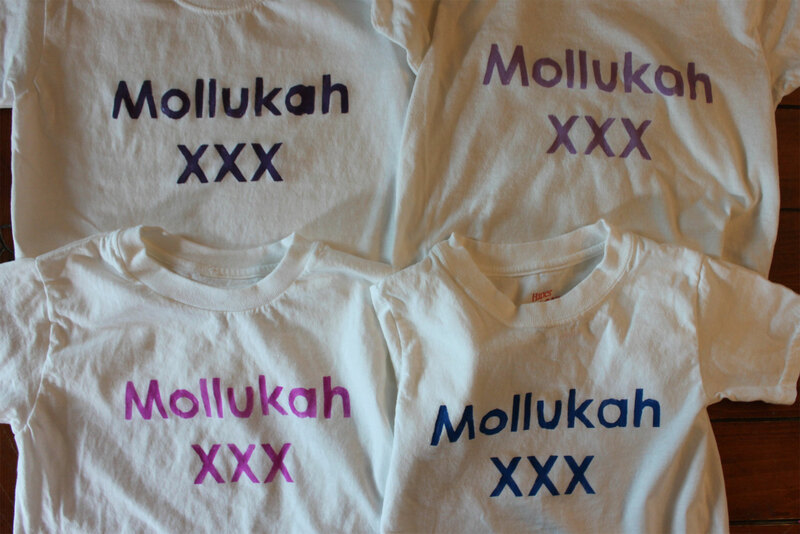 This time I used a stencil font (I print out the words and trace them onto the freezer paper before I cut) and that made the project easier than the Mollukah shirts because there were no insides of round letters to worry about. This was a different kind of freezer paper project. I saw this on Pinterest and had to try it. You print directly onto the shiny side of the freezer paper with your computer printer, then dampen the fabric you want the image on, then rub the printed image onto your damp fabric. I thought it worked pretty well. 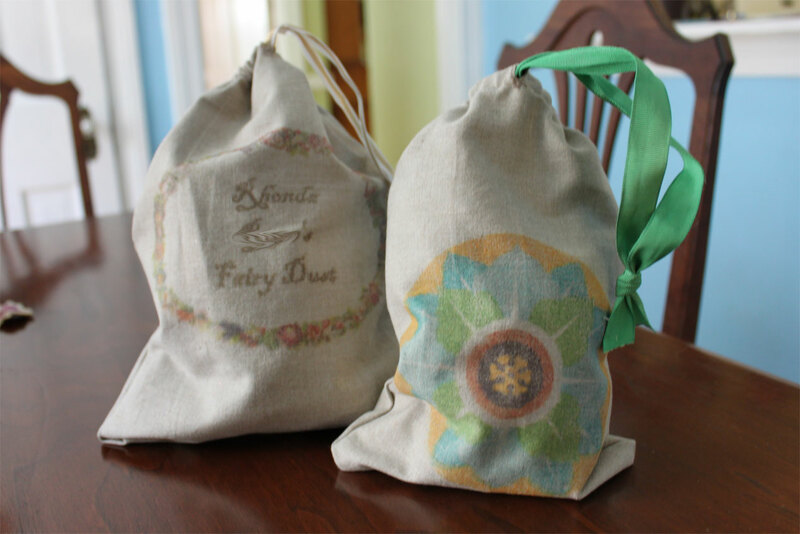 I made a little bag for a friend’s birthday and then another just for fun. These images look better if you’re going for a somewhat rustic or primitive look–they aren’t vibrant or crisp. 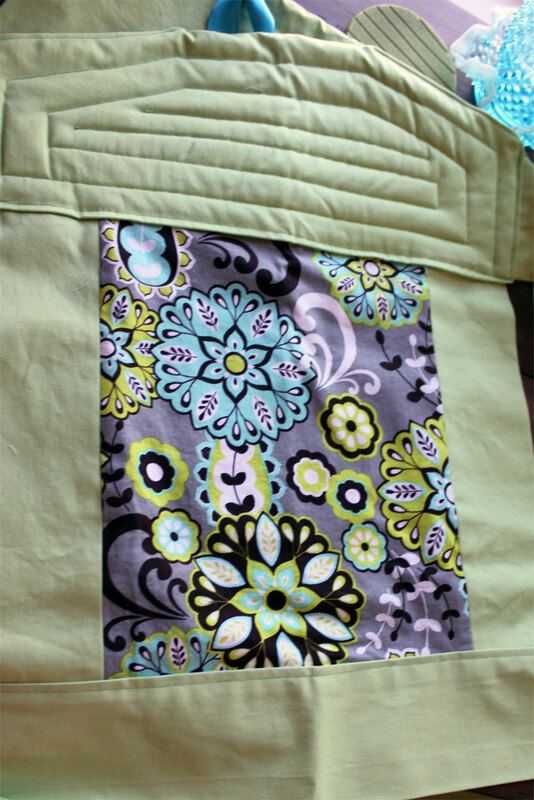 It’s still a fun, low-cost method and I’m sure I’ll use it again.